« How you can talk with God/ A Spiritual Experience! Titan is the second largest moon of Saturn. (Ganymede of Jupiter being the largest). Titan was discovered by a Dutch Astronomer Christiaan Huygens in the 1655 march 25. He named it Saturni Luna. Later John Herschel son of William Herschel(German born British Astronomer) named it Titan. Titan was a race of powerful deities descendants of Gaia and Uranus that ruled during the legendary Golden age. There are nearly 60 or more moons of Saturn. Some are very small and are still being studied. The largest among them is’Titan’ it is larger than planet Mercury. The NASA’s Cassinis mission has unfolded its charecteristics.. It is very dense, covered with heavy clouds. It is surrounded by an orange haze , differes from the rest of the Saturn’s moons. Titans dense atmosphere creates Green House Effect. The heat that comes from Sun through dim sunlight gets trapped inside. 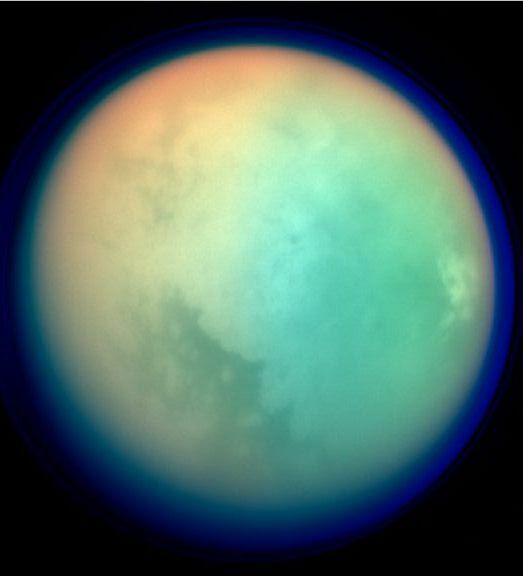 The scientists have found Titan very interesting as it may share some similarities to an early Earth. The Cassini – Huygens probe sent information about Titans atmosphere. ..Its atmosphere is active and complex, mainly composed of Nitrogen(95%) and Methane (5%). Elements like Carbon Oxygen Hydrogen are also found which are essential for life. Sand dunes made of hydrocarbons and liquid methane lakes are largely found. Earths atmosphere is made up of mostly Nitrogen and small amount of Oxygen (essential for human life). This similarity makes the scientist believe that Titan may harbor some kind of Life.They believe that lifeforms on Titans could have evolved to use methane in the way that lifeforms on Earth use water, and can survive in much cooler temperature than those on Earth. The lifeforms on Earth cannot survive on Titan. Titan has very weak gravity. If humans land there it will be possible for them to fly in its atmosphere. Methane is non poisonous but flammable. There is an abundance of Methane lake in the southern pole. Liquid methane evapourates and there is methane rain occasionally. Titan is covered with thick layers of ice. Its surface temperature is -290F(-179 degrees C). Its surface pressure is slightly lighter than Earth.There is no magnetic field . Titans diameter is (50%) larger than Earths Moon and is larger than planet Mercury but its mass is half than of Mercury. Titan orbits Saturn in neary 16 days. It takes 16 days to spin around its axis. Its rotation is called Synchronous- meaning that the same side of it always faces the Saturn. dighe31 on WHAT IS GRAVITY?